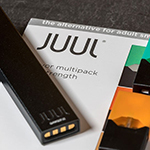 Juul Labs, which has more than 70 percent of the US e-cigarette market, has hired Capitol Hill veteran Chaka Burgess' Empire Consulting Group to handle legislative and Food and Drug Administration regulatory efforts regarding e-cigarettes and vaping products. The San Francisco-based company, which has been the main target over the public backlash against teenage vaping, announced plans to suspend selling flavored e-cigarette pods in retail outlets and end social media promotions, just ahead of the FDA announcement on Nov. 15 to impose sales restrictions of flavored e-cigarettes. "Our aim is to make sure no kid can access a fruity flavor product in a convenience store," said FDA commissioner Scott Gottlieb in announcing the new rules to curb underage use of tobacco products. Burgess, who has more than 20 years of experience in PA, coalition building, lobbying and ally development, is co-managing partner of Empire. Previously, he was VP-government relations at the American Gaming Assn., director of global government affairs at Amgen, federal lobbyist at Eli Lilly, and consultant at APCO Worldwide. Burgess is a board member of the Congressional Black Caucus Political Action Committee, an organization that will be invigorated with the January arrival of a Democratic-controlled Congress.